If you have been to the Norfolk Broads, you almost certainly noticed the reeds that grow on the fringes of most of the Broads. These are the famous Norfolk reeds, also known as water reeds, that have been used for centuries as the finest materials for thatching. The wind swept wetlands of Norfolk create ideal growing conditions for this very hardy reed, that can last for up to seventy years on thatched roofs when expertly bundled together. 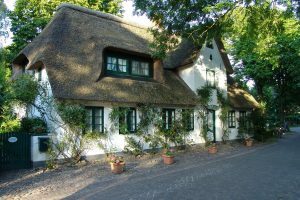 Also, Norfolk reed grows to a length that is ideal for use on English thatched roofs as it is can be fashioned into the curves associated with traditional English thatch. 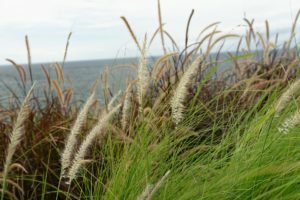 These characteristics create a strong demand for Norfolk reed that cannot keep up with supply so over 80% of the reeds used for thatching is imported. Thatchers will apply bundles of the water reeds directly to the rafters and arrange the bundles horizontally to create a neat appearance that is both waterproof and pleasing to the eye. In the South West, which experiences wet and windy weather, it is common for the water reed bundles to be attached by spars to the roof structure. Skilled Thatchers can mould these bundles into attractive shapes around chimney and tight corners. Although Norfolk reed is the most sought after thatching material, there are two other types of reeds that are commonly used in the UK. As its name suggests, long straw is specially grown from wheat for use in the thatching industry. 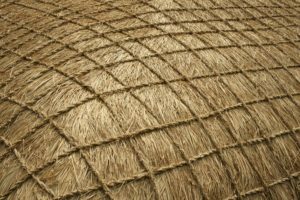 It is not formed into bundles like the water reeds, but is soaked in water and gathered into layers that are laid onto the roof and fixed down by batons. Soaking the straw allows it to become more pliable so that it can be moulded around corners and the chimneys. 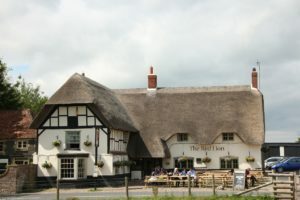 Long straw is one of the most widely used thatching materials, however as it is laid onto the roof, it creates an appearance that is not as neat and attractive as that created by Norfolk reeds. The image that springs to mind of thatched country cottages within “chocolate box” settings, is probably due more to the use of water reeds, than the softer looking roofs made from long straw. Combed wheat thatch is similar to long straw, however the wheat straw goes through an additional combing process to move then stems and small leaves, leaving the stems that can be tightly gathered together to create a waterproof and wind proof finish. 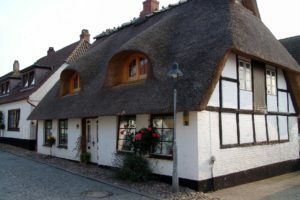 This thatching material is often used in the South West where traditional thatched roofs are not as steep as those in East Anglia. Presumably the strong Dutch influence resulting from when their engineers were used to drain large areas of East Anglia forming the Fens and Norfolk wetlands. 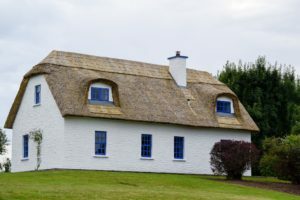 Combed wheat reeds are applied to the roof in a similar way to Norfolk reeds, thereby creating the attractive thatched roofs often seen in villages in the South West. 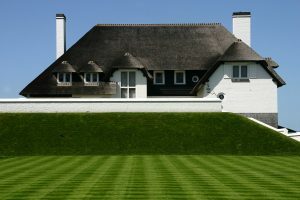 The different thatching materials influence the costs of renovating and replacing thatched roofs. For example, long straw is the most labour intensive to apply so using this material could result in higher labour charges. 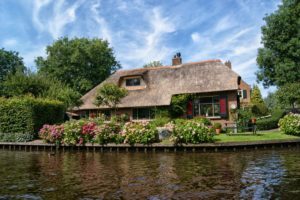 In general, the type of materials used should not have a major affect on thatch insurance premiums, however it is always sensible to discuss your requirements with a reputable broker to ensure that you are purchasing the best cover for your needs. 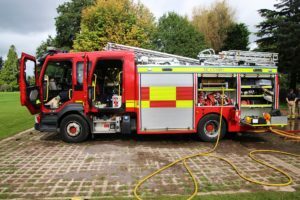 It is factors such as fire risks and the maintenance of your thatched roof that is more likely to be of interest to your insurance company, so talking to your insurance broker is very important.